The results of Quantock Veterinary Hospital ‘Pet of the Year’ 2015 competition are in! Every year the clinical and administrative team vote for their favourite – bravest, most remarkable, most adorable – pet they’ve treated over the year. It’s never an easy decision as there is a huge number and variation of fascinating pets and cases. 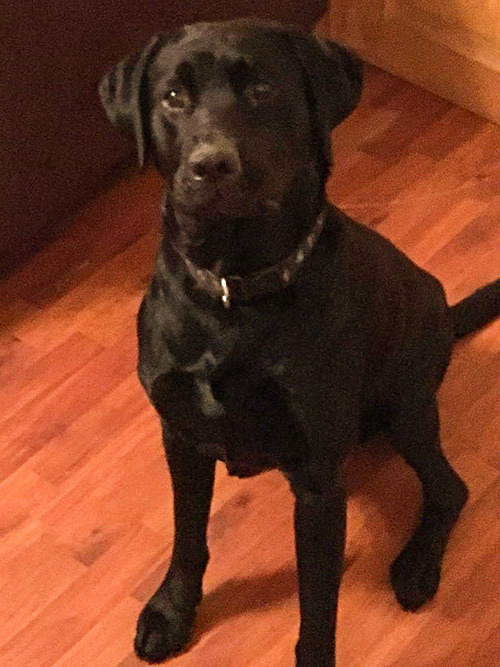 However, their Pet of the Year for 2015 is… Ozzy, a one year old, male black Labrador. Ozzy came into the surgery last February with a two day history of vomiting and anorexia. On examination alarm bells began to ring when veterinary surgeon Zoe Berry thought she could feel something firm in his abdomen and Mrs Cottey confirmed that Ozzy – like most Labradors – had a naughty habit if eating things he shouldn’t! Ozzy was admitted for further investigation. An x-ray of his abdomen showed there was some gas build up in the loops of intestine but no obvious blockage could be seen. However certain objects will show up better than others on x-ray and some objects, such as fabric or plastic, will not show clearly at all. Therefore Ozzy also had an ultrasound scan to give us some more information. The ultrasound scan clearly showed dilated loops of intestine with some kind of foreign material in Ozzy’s stomach and intestine. This was causing a blockage and in view of the fact that Ozzy was now unwell the chances of it passing naturally were diminishing. The decision was therefore made to take Ozzy to surgery that afternoon.